Khabib Nurmagomedov has received his punishment from the Nevada State Athletic Commission (NSAC). 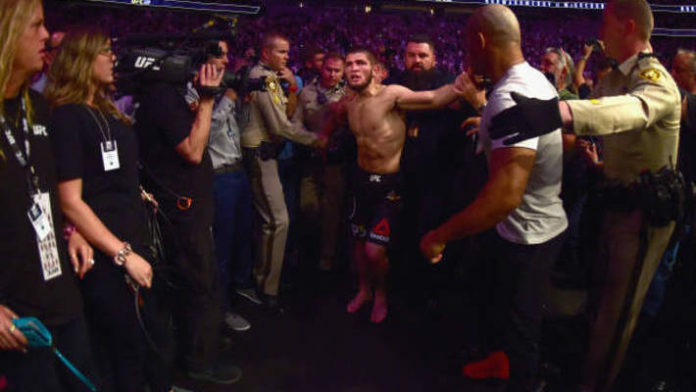 Nurmagomedov was awaiting a final punishment for his role in the UFC 229 brawl. After submitting Conor McGregor back in October 2018, Nurmagomedov leaped into the crowd and went after the “Notorious” one’s teammate Dillon Danis. This sparked a brawl and punches were thrown from Nurmagomedov’s team. At a commission hearing earlier today (Jan. 29), it was determined that “The Eagle” will be suspended for nine months and fined $500,000. Nurmagomedov’s suspension can be reduced to six months if he partakes in an anti-bullying PSA. The suspension is retroactive to Oct. 6. Nurmagomedov’s ruling was handed down before McGregor’s. The “Notorious” one ended up being suspended for six months retroactive to Oct. 6 and he must pay a $50,000 fine. Nurmagomedov’s teammates Abubakar Nurmagomedov and Zubaira Tukhugov also received suspensions. Both men have been suspended for one year retroactive to Oct. 6 and will each pay a $25,000 fine. Many aren’t expecting Nurmagomedov to fight this summer as he will be celebrating Ramadan. It’s also unlikely that he will compete without Abubakar and Tukhugov in his corner. What do you make of Khabib Nurmagomedov’s suspension?